Privacy - Its hard to relax and really enjoy your hot tub if the neighbors are staring at you. Take advantage of natural privacy shields if they are there. If not, you will want to keep that in mind as you design your hot tub deck. Accessibility - You will likely want to keep the hot tub relatively close to your house. Think about the back and forth trips for snacks, drinks, bathroom breaks, etc. No need to hike if you don't have to. Safety - Any time you have more than a couple inches of water, plan carefully to keep small children safe. Utilities - Keep in mind that you will need electrical power to run the motors. Underground electrical service is not inexpensive. The closer you are to the source, the less it will cost. You'll also need water of course, but that can usually be handled with a garden hose easily enough. So think it through before you just pick a random spot for your hot tub. What's So Special About A Hot Tub Deck? What makes a hot tub deck any different from a regular deck? Weight! A hot tub deck has to support far more weight than a deck made for regular use. A typical hot tub weighs around 700 pounds without any water or people in it. Add 350 gallons of water at 8.35 pounds per gallon and that's another 2900 pounds or so. If four adults, averaging 170 pounds each, get in the tub, you now have about 4300 pounds. And all that weight is concentrated in a small area of your deck. That is far more weight than standard residential deck codes anticipate. DO NOT just put a hot tub on your existing deck - unless that deck was designed for the weight. The deck could (and probably would) fail, resulting in potential serious injury, even death. How Do I Know My Hot Tub Deck Is Strong Enough? Whether you are planning to add a hot tub to an existing deck, or building a new deck for that hot tub, you obviously will need to design and build it to support a great deal of weight. My advice is to consult a structural engineer and get his direction for the design. The engineer will need the specifications for the hot tub in order to design for it, so have that information readily available. Yes, those engineers charge for their services, but which is more expensive, paying the engineer or replacing the hot tub, the deck, and maybe some broken bones? Like I said, use an engineer. A competent deck builder should be able to work with a structural engineer and incorporate that service into their overall project cost. Be sure you get a copy of the engineers report and file it away. 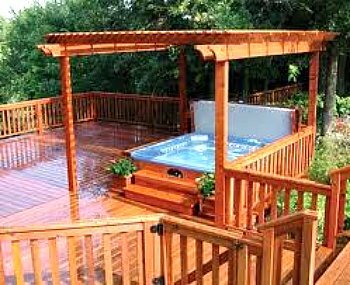 If you are modifying an existing deck to accomodate a hot tub, the engineer will need the specifications of the existing deck as well. If you can't provide that information to him or her, they may need to visit the site for a first hand look. You will likely need additional footings, more (and maybe larger) support columns and joists, and maybe additional bracing. If you have the option, placing the hot tub on the ground is generally the best and easiest way to support the weight. 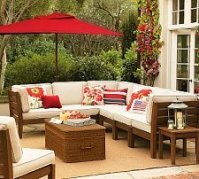 If you have a patio, that works great. But if you need to have your hot tub on an elevated deck, that works too. Just be sure to adequately support the weight. If you're really lucky, and at least part of your deck is close to the ground, you may be able to cut a hole in the deck and place your hot tub on the ground through the hole. Of course the ground needs to be level, preferably with a concrete slab. You could end up with a partially recessed hot tub - a great look! Which Style is Best For Your Hot Tub Deck? Okay, now the good stuff. 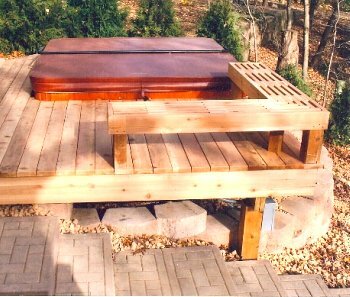 You've taken care of the deck strength issue and you're ready to choose a design for your hot tub deck. As far as the placement of the hot tub itself onto the deck, you have three options; 1- place the hot tub directly on the surface of the deck, 2- recess the tub into a hole in the deck, with the rim just above deck level, and 3- partially recess the tub into the deck - somewhere between #1 and #2. Any of these options are fine, but they are different, and each has its own unique considerations. How Do I Recess My Hot Tub Into My Deck? 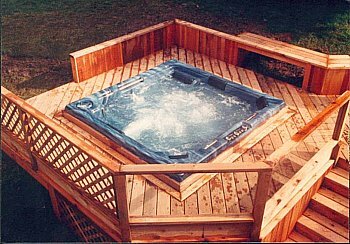 In order to recess your hot tub into your deck, you will essentially need to build a seperate deck, or a platform, to support the hot tub itself. That platform will be built at a lower level than the rest of the deck. 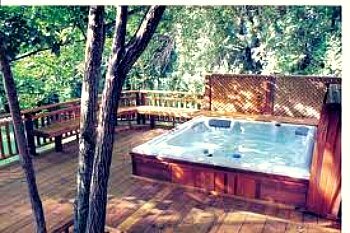 When the hot tub is placed on the platform, the rest of the deck is at the higher level and is built to the edge of the tub. If your hot tub is placed on the ground, you will not need the tub platform, but the rest of the process is the same. If you are going to modify an existing deck to accomodate a recessed hot tub, you will need to cut a hole in the deck and construct a platform for the tub below that hole. You will also be cutting deck joists, and possibly girders or support beams. If you can position your deck so that you don't need to cut support beams your work will be easier. Whatever components you cut will need to be repaired. (except for the actual deck boards that used to cover the hole. Joists, girders, beams, posts, footings, all of these items carry the load of your deck. So if you remove them to create a hole you will need to replace that structural support. So headers, new joists, new girders, additional post and footings - any or all of those may be required. But usually, there is a much easier way! You can usually avoid cutting up your existing deck. Unless you don't have room, consider building your hot tub platform adjacent to your existing deck. Then you can build an addition to your existing deck that will surround your hot tub. So you build the deck around the hot tub rather than dropping your hot tub into your deck. Much easier! But if conditions prevent you from doing that, you can cut a hole and drop the hot tub into it. 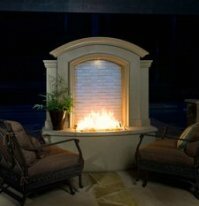 If you plan to have your hot tub at ground level, like on a patio or a slab, you can use the same technique to create a hot tub deck surrounding the tub. Another way to surround your hot tub is to build tiers or steps around it. You can create that recessed look without actually lowering the hot tub. You hot tub can be at ground level or at the level of your existing deck. 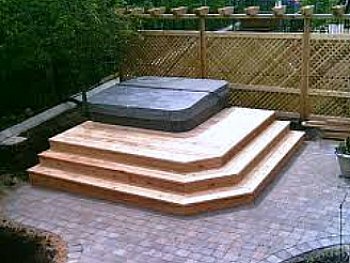 By building a series of steps you get your deck level up to the level of the rim of your hot tub. Be creative. Just take your time with the planning stage of your hot tub deck project. Make sure the various levels are carefully measured and planned so that you arrive at the proper level when you're through. If you choose to fully recess your hot tub into your deck, be aware of the safety aspect. Since the top of the hot tub will be at ground level, you'll want to be especially careful with the walking area around your hot tub. Make sure you carefully control the area if children or elderly folks are going to be in the area. Curious children or inattentive adults could easily fall into the water. Or Uncle Lenny, but that's for a different reason. You know how he gets! A fully recessed hot tub looks great. It looks to be fully integrated into the design of the deck. What If I Can't Recess My Hot Tub? Or I Don't Want To? If your deck is too close to the ground, or if if the safety concerns eliminate a fully recessed hot tub deck design, you may consider placing your hot tub directly on the surface of the deck. 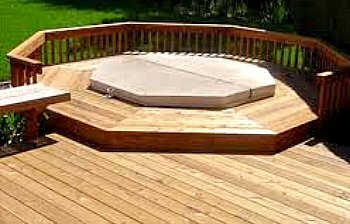 This type of installation is less expensive - since there is no hole cut into the deck and there will be a standard one level deck design. (of course, designed and built to accomodate the extra weight) This design results in a less integrated look. Your tub will just be sitting on top of the deck, not built into it. But you will gain safety and mobility. Nobody will accidentally walk into the hot tub - well, except for Uncle Lenny, but again, that's different. But you should still protect small children from accessing it. And you will be able to move the hot tub to another location should you want to, provided the new location will support the weight. Most hot tubs are available with an attractive surround, so your hot tub will still look nice. 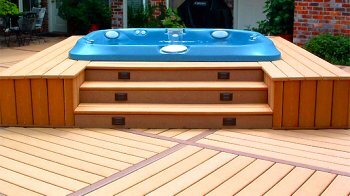 A great hot tub deck design is a combination of the first two options. A partially recessed installation will provide the integrated, customized look, while maintaining a safe barrier to prevent accidents. Getting into and out of the hot tub will be easier since the lip of the tub will be closer to the deck surface. You will not be able to move the tub easily, but if you're careful with the initial positioning that isn't likely to be an issue. Weigh out the options - safety, mobility, and appearance - and decide which of these three methods work for you. Once that decision is made you can start thinking about the "extras". As always, think big picture when locating and designing your hot tub deck. You don't have to do everything at once, but you don't want to create a problem for your overall design by failing to think and plan. Will you want a cover over your hot tub? How about a pergola? 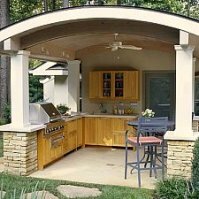 Don't place your hot tub between your outdoor kitchen area and the area where you will eat and entertain. Should you add some built-in benches to your deck near the hot tub? Will you need railing and a gate to prevent unauthorized or unsafe access to your hot tub? Plan carefully and you'll head off future headaches. And have fun!